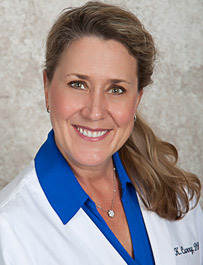 Dr. Katherine Curry has been a specialist in orthodontics for over 20 years. Born and raised in Chatsworth, California, she attended San Jose State University for her Bachelor of Science degree in Biology. Her dental training was completed at Fairleigh Dickinson University, where she earned her Doctorate of Dental Surgery and was inducted into the prestigious Omicron Kappa Upsilon national dental honor society upon graduation. Continuing her education, Dr. Curry completed a General Practice Residency at New York Hospital/ Cornell Medical Center and an Orthodontic Residency at Medical College of Georgia. She attends frequent local and national meetings in order to stay abreast of the latest techniques and technologies in orthodontics. Dr. Curry is also a member of the San Fernando Dental Society, where she is currently a member of the Orthodontic Peer Review Committee and the Legislative Committee. Dr. Curry has been a resident of Simi Valley for over ten years. Her husband is a Captain with the Los Angeles Fire Department. They enjoy traveling, cooking, and entertaining for family and friends.